Not only do the best men's walking shoes enable you to explore the countryside without feeling as though you're being weighed down in chunky boots or stiff wellies, they're usually cheaper too. Good for your comfort levels and for your wallet! Offering enhanced grip compared to your average street trainers (as well as better mud-repelling abilities), our featured walking shoes for men incorporate a waterproof membrane. Why is that important? It works to keep the wet out, making this type of footwear ideal for autumn and winter too. It also means they'll survive walks across wet sand. Plus, they have stiffer soles and enough cushioning to keep you in comfort for days. Not only does this prevent foot fatigue, it reduces any impact from the ground. Again, this is all about help your feet to feel comfortable for longer on those short or epic walks. The big question is, what type of walking are you buying shoes for? Fast and light walking shoes put breathability at the top of the features list, while regular dog walking trips need a more robust, waterproof vibe. With that in mind, our top pick for the best men's walking shoe is the Columbia Fairbanks Omni-Heat Boot. It's ideal for lower-energy rambles that require warmth, comfort and waterproofing, and it looks pretty good with jeans and trousers. Why do you need specific shoes for walking? The reasons for getting a good pair of men's walking shoes are many and varied. From being able to stuff your muddy shoes in the boot and drive off in a fresh pair, through to getting the ultimate fast and light performance in the hills and trails, there are plenty of plusses to a well chosen pair. When buying the best men's walking shoes for you, the consistent things you should be looking for is a reinforced sole (usually TPU) to fend off stones underfoot, a robust rand to protect the sides, and an aggressive, grippy sole. There's a whole sub-category of walking shoes dubbed ‘approach shoes’, which build in more scrambling and rock climbing orientated traits, like sticky rubber and extended lacing to grip the entire foot tightly. Many walking shoes will have a waterproof membrane built in, which can be useful in wet grass, for example, but can also limit breathability if you’re really gunning it, so worth considering how you’ll mainly be using your shoes. Unlike boots, rain resistance in walking shoes is a bit of a red herring, as without the closed calf of the boot your feet will be soaked in heavy rain, waterproofing or not. Indeed, walking shoes are for casual rambles and path-based wanders, rather than full-day hikes in off-road conditions. If you’re planning long mountain days out, the better support and overall robustness of a hiking boot is more suitable. Although spec is important in walking shoes, sizing is far more essential when buying. So it's a good idea to try a few pairs on to get a good idea of any potential issues. Also, keep in mind that if you are planning high-energy walking pursuits, you might want to size up as you would for running shoes, because your feet swell over longer stretches. While you’d be best off with the extra support of boots for the really rough stuff, proper walking shoes are ideal for lighter hikes, short approaches and summer rambles, as well as faster and lighter mountain expeditions. Some have made their lightness and flexibility around the ankle more of a benefit by incorporating sticky rubber and protective high rands to deliver a hybrid approach/scrambling shoe that can cope with pretty much anything in the hills. The key is to pick a comfortable fit and the correct sizing, as well as considering the terrain you'll be covering. Some of our best men's walking shoes choices offer a ‘mid’ option, providing some support akin to a boot but with more ankle movement. More aggressive tread patterns are ideal for muddy conditions, but handle rocky smearing poorly, while stickier rubber will wear out faster and can be slippy in muddy conditions. Our current top pick for the best men's walking shoes, the stylish Columbia Fairbanks is at home in both town and country. The design is an ingenious blend of walking shoe and snow boot, with an inner waterproof membrane keeping the damp at bay. Elsewhere, the combination of Omni-Heat reflective lining and 200g insulation works to keep your toes toasty in the coldest conditions. In fact, these walking shoes for men they’re rated to a truly Baltic -25F / -32C. Non-marking Michelin outsoles do a good job of making traction happen on all types of surface, and a Techlite lightweight midsole provides energy return as well as cushioning for long rambles. A welcome winter warmer that’ll serve you well, right through till spring. When comfort is the order of the day on a ramble, Keen’s updated Targee range is an excellent first stop. Available in shoe, medium and high versions for increasing levels of support, the redesign brings improved traction (thanks to a revamped sole) and a rugged feel. With a high rand to protect the genuine leather upper, and a bespoke lacing system to keep your heel locked into the snug rear pocket, these are the ultimate three season, low-level walking shoes for men. Final neat touches include a proper footbed insert, and a built-in membrane liner to keep rain out, as well as to enable sweat to evaporate. The Alnasca Knit builds on the Alnasca platform, to quote Stirling Moss, by adding lightness. The old leather upper is gone, replaced with a considerably more techno 3D knitted upper, adding breathability without sacrificing strength. Aimed at fast and light mountain travel, this best men's walking shoes contender plays to Mammut’s mountain credentials as well as looking reasonable when worn to the pub after a country walk. The 3D knit also boosts comfort, as the sock construction is entirely seamless, very much in the vein of a high-end running shoe. A three-dimensionally shaped TPU heel envelope is designed to protect against twisted ankles, while a full lacing system should keep these stable enough for rock-climbing moments. The Michelin OCX rubber outsole promises plenty of stiction on rock and grass, too. If you regularly go on hikes, the Salomon Evasion GTX is one of the best men’s walking shoes for handling uneven terrain. The shoes feature waterproof Gore-Tex tech, foam heels and a gusseted tongue, making them ideal for traipsing over rocks. They are resistant to debris, so they won’t get ruined after one walk, and they'll keep your feet warm and dry in wetter, harsher conditions. Like our current top pick from Columbia, these shoes deliver hiking boot-level support and are comfortable enough to wear daily without any rubbing. Lightweight, breathable and comfortable, the South Rim 600 is a real go-anywhere walking shoe, designed for city style and trail-happy performance. 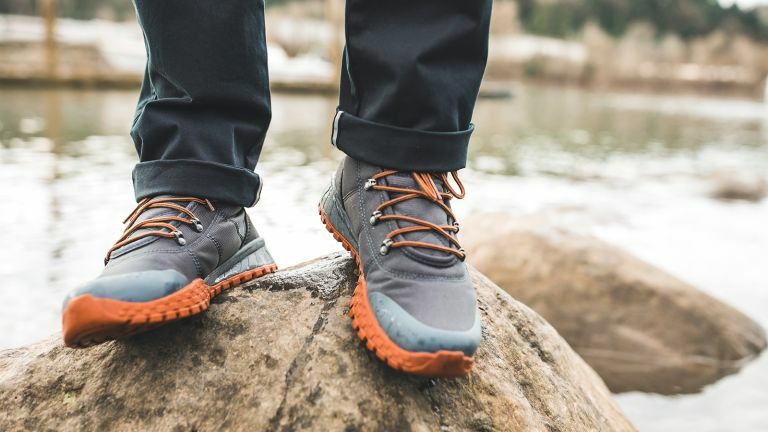 Built on the super-cushioned Vibram SPE platform from the popular Mountain 600 hiking boot, the South Rim adds Air Mesh for ventilation in hotter climes, but will let in rain in more temperate ones. Self-adapting lugs and a Megagrip compound ensure superb grip on wet and dry surfaces, making these walking shoes perfect for rainy days and crisp autumn walks. A solid option from Canadian outdoor designers Arc'teryx, the Konseal FL is aimed squarely at delivering speed and agility across technical terrain. How? By borrowing design cues, fit and ethos from trail running shoes. The streamlined design and attention to detail across the shoe means you won't regret sporting a pair of these, whether you're on an alpine adventure or heading to the pub after a day spent exploring outdoors. The Five Ten Guide Tennie is a stone-cold classic in approach shoes. While a comfy and durable walking shoe to the untrained eye, the addition of an incredibly sticky Stealth rubber sole makes this a proper climbing shoe in disguise. For summer scrambling, it’s perhaps the best men's walking shoe on the market and has stood the test of time, with minimal changes, since 1995. We love the ankle to toe lacing, for achieving a custom fit and adjustment, and the internal rocker for increased walking action efficiency. If you’re looking for build quality and technical ability, AKU’s boots and shoes are always worth stepping into. The Tengu Low is a shortened version of the company’s award-winning Tengu GTX boot, and as such it retains much of that winning formula. Of particular note is the enormous protective rand, as well as a super-stiff 4-2mm nylon and die cut EVA last. The upper is a mix of suede and ‘air 8000’, for ace breathability, while a Gore-Tex elastic sock takes care of water ingress and egress. These men’s walking shoes are ideal for those who do a lot of casual walking with the occasional serious trail thrown in. The Vojo Hike feature Texapore lining and are wonderfully lightweight and breathable. The suede outer helps these shoes to look more casual than perhaps a more classic walking and hiking shoe, and the grey colourway is easy to team up with with most walking apparel, although the grey is a lot darker in the flesh. More importantly, the soles of these walking shoes boasts superior grip, so if you often find yourself trekking up slippery hills, these are a winner. Adidas' shoe-based answer to an amphibious landing craft, the Voyager is designed for extremely wet conditions, such as gorge walking or coasteering. The big sell is a quick-drying Climacool upper and a built-in drainage system through the sidewalls to shift serious levels of water. There are other reasons to put these on your shopping list... Including the Stealth rubber outsole, widely used in performance climbing shoes for its stickiness. That paired with a massive tread should give you solid grip on pretty much everything you'll come across outdoors. A baked-in Polygiene treatment on the liners should keep end-of-day pong to a minimum, too. Dedicated walking shoes boost your comfort outdoors, and, depending on their design, keep your feet dry during rainy spells. They tend to be a bit more stylish than hiking shoes, too, as seen with our top choice for the best men's walking shoes, the Columbia Fairbanks Omni-Heat Boot. This clever walking-shoe-meets-snow-boot hybrid is designed to keep your feet dry and warm even in sub-zero temperatures. Our other recommendation is the Mammut Alnasca Knit GTX men's walking shoe. With its alpine pedigree and road-running shoe tech, it delivers a strong performance. Mark Mayne is an outdoors journalist who specialises in camping, hiking, and diving.